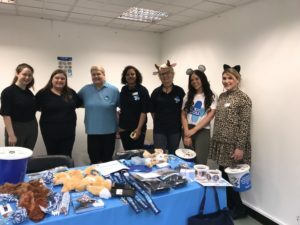 Poppy-PR Uses ‘Animal Instincts’ At Derby Store Wars 2018! Poppy-PR took on other local businesses to engage with their ‘inner apprentice’ for charity, as Derby Store Wars returned to the city on June 1st. The Apprentice style competition, which saw a variety of different businesses taking over city centre charity shops for the day to boost revenue and compete against each other, returned as part of National Volunteers Week 2018, and our team took part! Hosted by Business in the Community, Prince Charles’ responsible business network, in partnership with Community Action Derby, this year’s event also encompassed stalls at Derby Market Hall, where entrepreneurs worked on behalf of their partner charities to take this year’s title away from PX Tech – last year’s winner. Sara Mitchell, from Business in the Community said: “All that you needed as a business to apply was at least two staff members to help run a stall or shop, and your business expertise, along with the willingness to go all out! The event had many businesses signing up to the challenge including, Motorpoint Derby, Leek Building Society, M&S Distribution Centre, The University of Derby and Poppy-PR, which offered its PR support. Tina Clough, Managing Director at Poppy-PR said: “We were delighted to be approached for our involvement in this year’s Store Wars event, after conducting a successful PR campaign for the team last year. The event was great fun and we worked to raise as much money as we could for The Blue Cross. Our team dressed up as animals, hired a face-painter during half term and ran the Blue Cross Dog of the Year Competition!